Hassle-free convenience. No tools required. 4.4" x 14.85" x 3.5", 1 lb. Need any easy way to transport your bow, or mount your gun? 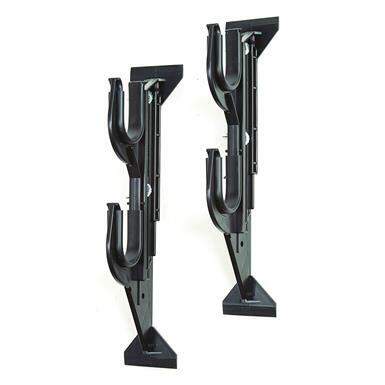 Use this hassle-free 2-Gun/Bow Rack by Allen®. No tools are required to mount it in your truck, or on your wall. Non-marring Molded Plastic construction protects your gun or bow's finish. Adjusts from 9" to 13" high for added convenience. Dimensions: 4.4" x 14.85" x 3.5"